When creating a pencil drawing of a fairy, it is important to remember to make her look tiny and mystical - I'm only reminding you to do that because I forgot to do it! This is my version of a fairy butterfly - butterflies are symbolic and in my imagination, they make good neighbors for the fairy. Before I produce my pencil drawings of fairies, I visualize what I want to see - that would be things like: a flowing skirt, long hair, wings, a wand, and something from nature. At this stage of my experience, I was in my third year of teaching myself to draw and I can see some improvement which is great. Let's get started on the first drawing of a fairy. 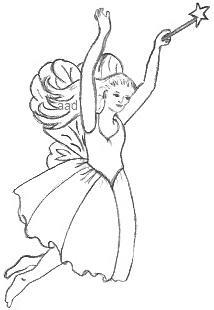 Here is an outline of a fairy for you to practice with. Drawing the body is not the easiest of tasks because she has to be in proportion. Beginner artists should not be shy to measure and use tiny marks on the paper to ensure a correct drawing first time around. You can make these little marks from top to bottom and then at intervals, like the size of the head, body, etc. As usual, I have lots of trouble with drawing faces. So, for this outline, I have turned the fairy so we can barely see her profile - making it so much easier for us to draw successfully. This posture allows you to add in extra detail like portraying her smelling flowers or kissing a butterfly. These are simple fairy sketches so you can create the backgrounds with whatever you see in your imagination. If you have already formatted a story prior to starting to draw, the background will come easily to you. 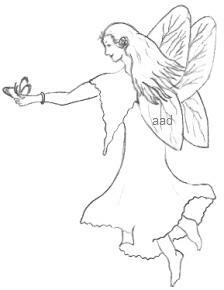 In this pencil drawing of a fairy, I am really pleased with the look I have managed, almost princess-like. I have to tell you I am very proud of it! We have established that fairies are tiny, so do you imagine they are living amongst flowers? If you are looking for an idea on what to draw, you can draw your favorite flower and put the fairy on a petal. Fairies were introduced to us as children. I remember experiencing a special feeling of wonder whenever I read or was told a story about fairies. It was a whole other world that I created in my mind. I was also fascinated by the tooth fairy and it was an exciting time being visited by one. My imagination went wild - those were the days! The other nice thing about fairy stories is that they always end with "happily ever after" - no violence, no nastiness, they are beautiful and peaceful. Oh, okay, I will admit that I still love fairies! A fairy tale doesn't always have fairies involved. Most fairy tales contain a lesson to be learned and always give a sense of hope. To get further ideas for drawing fairies, you can refer to photos of your children to copy their innocent pose and then create your fairy with a fantasy background. Draw with patience and keep practicing! To show you what's possible when you keep trying to draw, here are some of my first attempts at fairy drawings and see another sketch of a fairy which was done more recently. This image on the right is my least favorite pencil drawing of a fairy so I show it to you now to prove that not all of your drawings will be perfect. 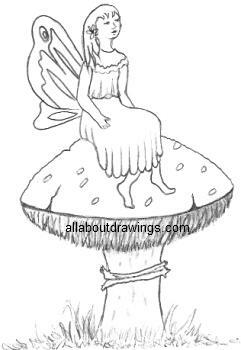 Try to create a magical illusion in your pencil drawings of fairies -- you can draw tall blades of grass around her or maybe have her riding a butterfly. Don't forget, fairies steal your treasures, so you can put those items in your drawings as well. Play around until you are satisfied with your pencil drawing of a fairy. If you are erasing too much, it's a good idea to start another drawing - your second attempt will always be a better version than the first one. Good luck and may the good fairy shine on you!